A darker shade of magic / V. E. Schwab. Summary: "From V.E. Schwab, the critically acclaimed author of Vicious, comes a new universe of daring adventure, thrilling power, and parallel Londons, beginning with A Darker Shade of Magic. Kell is one of the last Travelers--magicians with a rare, coveted ability to travel between parallel universes--as such, he can choose where he lands. There's Grey London, dirty and boring, without any magic, ruled by a mad King George. Then there's Red London, where life and magic are revered, and the Maresh Dynasty presides over a flourishing empire. White London, ruled by whoever has murdered their way to the throne--a place where people fight to control magic, and the magic fights back, draining the city to its very bones. And once upon a time, there was Black London...but no one speaks of that now. Officially, Kell is the Red Traveler, personal ambassador and adopted Prince of Red London, carrying the monthly correspondences between the royals of each London. Unofficially, Kell is a smuggler, servicing people willing to pay for even the smallest glimpses of a world they'll never see--a dangerous hobby, and one that has set him up for accidental treason. Fleeing into Grey London, Kell runs afoul of Delilah Bard, a cut-purse with lofty aspirations, first robs him, then saves him from a dangerous enemy, and then forces him to spirit her to another world for a proper adventure. But perilous magic is afoot, and treachery lurks at every turn. To save all of the worlds, Kell and Lila will first need to stay alive--and that is proving trickier than they hoped. " -- Provided by publisher. Meet Kell, a young man with an extraordinary gift: unlike almost everyone else, he can travel from one version of London to another, moving between parallel worlds the way ordinary people walk from one room to another. 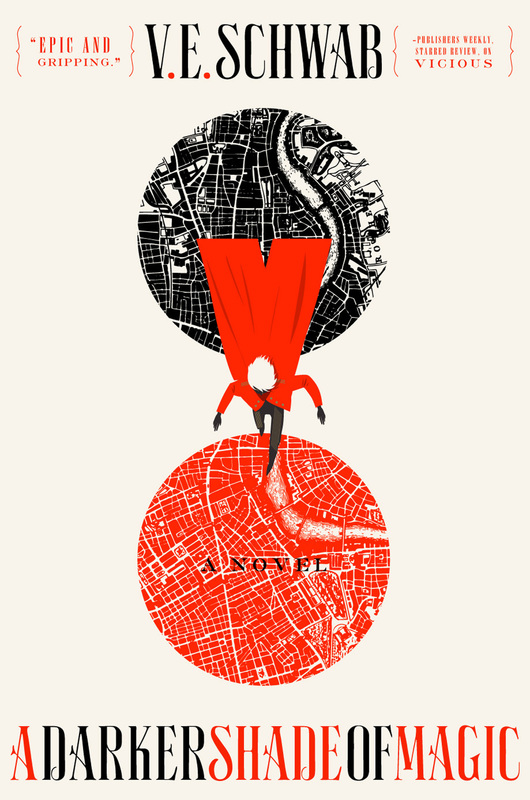 His job: carrying correspondence between the rulers of Red London (a city rich in magic), White London (where the relentless fight to control magic is destroying the city), and Grey London (where magic no longer exists—the London of our own past). Kell also has a secret sideline: he smuggles artifacts from one London to another, getting top prices from collectors. When he gets caught up in a bad deal in Grey London, he goes on the run, at his side a clever thief named Delilah, who helps Kell elude his pursuers, desperately trying to find a way not only to save Kell's life, but also to protect the parallel worlds themselves. An ingeniously clever tale. Copyright 2014 Booklist Reviews. [Page 76]. (c) Copyright 2014. Library Journals LLC, a wholly owned subsidiary of Media Source, Inc. No redistribution permitted. [Page 74]. (c) Copyright 2014. Library Journals LLC, a wholly owned subsidiary of Media Source, Inc. No redistribution permitted. Kell, a rare Traveler, serves as messenger and de facto prince of Red London, carrying corre-spondence between three parallel Londons and, in his own time, smuggling tourists between cities. When this side business casts Kell out of favor, he must work with Delilah Bard, an ambitious cutpurse from magicless Grey London to save all of the worlds. VERDICT With more depth and substance than a gimmicky concept, this inventive adventure and its colorful eccentric characters provide the perfect summer escape. (LJ 12/15/14) (c) Copyright 2015. Library Journals LLC, a wholly owned subsidiary of Media Source, Inc. No redistribution permitted.